Another incredibly adaptable, low prop activity with great built in metaphor potential is Blind Polygon or rope shapes. I have seen facilitators use this activity, and it’s variations, in very creative ways to address a range of topics, including challenges of perspective and communication, decision making, comfort zones, etc. It is also a wonderful follow-up activity for any discussion or workshop related to styles of interaction, leadership, or comfort zones—including application of True Colors or Myers-Briggs. Set Up: You will need a length of rope or webbing (overall length determined by group size and outcomes). I knot the ends securely (with a double fisherman’s for rope or water knot if you are using webbing). I use retired climbing ropes. This way I know that if a group pulls hard on the circle, the knot is secure and the rope strong enough to avoid mishaps. I make my circles large enough so that my group can stand comfortably round he outside of it, everyone holding onto it at waist height with both hands, and still have a comfortable distance (no less then a foot or so) between participants. There are times when I expand the size of the circle (see below), but for most applications, you don’t want to make it too big. 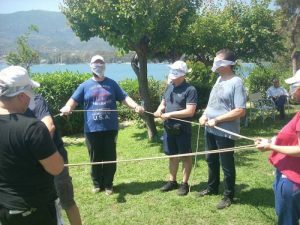 Basic Activity: Once everyone is around the rope circle, holding the rope at waist height with both hands, I let them know that this is a blind activity and may ask the group to close their eyes and wait for more information. Hands can slide but need to stay attached. And (in the simple version) everyone can talk. I always start with simple shapes and increase the difficulty as we go along. Basic shapes include triangles of various kinds, squares and various other polygons. Later versions can include cubes and other odd shapes such as “clubs,” “spades,” and “hearts” from card decks, etc. What you do will depend on the group and your outcomes. Debriefs in between rounds tend to be simple: What worked? What happened? What would you change for the next round? Who are the “leaders” during each round? How was that decided? What I focus on during debriefs also depends on what we have done to that point in the program, the needs of the group and possible additional outcomes or issues we are addressing. Expand the rope size. Doing this may make issues of communication more obvious. Divide the group in half. One half of the group will set up with the rope, eyes closed just as before. 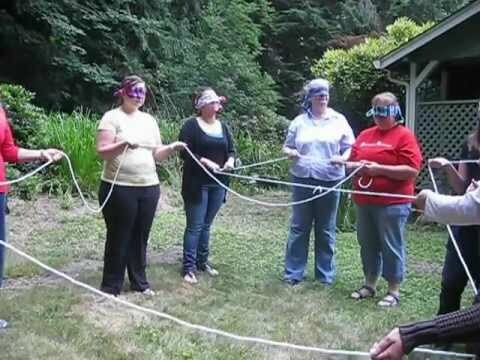 The rest of the group is not holding on to the rope, but is around the outside of that circle with instructions that they can see, but they can only whisper when they talk. Provide shapes for the group to create with the rope as before. This variation works great for illustrating points about normal issues in groups as people see things from different perspectives and work to find ways to communicate from those vantage points. Set is exactly like the previous variation, however in this situation, have participants work in partnerships, with one partner in each partnership “blind” and holding onto the rope, and the other partner “sighted” but only able to whisper. Questions can then be asked about whether communication took place between all of the sighted members and if there was clear communication about the overall vision and process. Was there a group plan? Why or why ? Set the activity up with people role playing different “attributes” including a “rebel contrary,” someone blind and connected, and others sighted but mute or whisperers. Be creative here depending on the group and specific outcomes. This works best if roles, parameters, etc. are given in advance with instructions for all participants not to divulge their “attribute.” This is a great metaphor for the challenges of diversity and perspective, the realities of working in a group, trip group or cabin or other similar situation. It is also possible to set this up for corporate groups with different “departments,” and modes of communication, for example: written memos only being passed to the sighted whisperers, etc. I know that there are many other versions and variations. We invite you to share other ideas or variations you have used or seen in the comment section below. This entry was posted in Leadership, News, Training.